First, it allows the applicant to work in the United States legally. Secondly, if Form I-131 (Application for Travel Document) was filed in conjunction with the I-765 (Application for Employment Authorization), the applicant can also travel internationally with their valid UNEXPIRED passport. 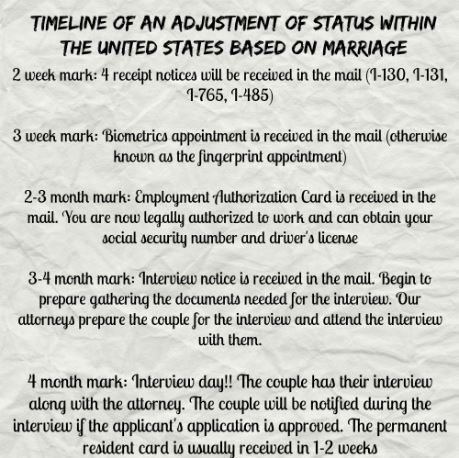 Our office also recommends that the applicant have in their possession their original receipt notices and copy of their marriage certificate when traveling domestically and internationally. NOTE: YOU SHOULD NOT TRAVEL INTERNATIONALLY UNTIL YOU RECEIVE THE ADVANCE PAROLE/EMPLOYMENT AUTHORIZATION CARD COMBO IN THE MAIL. You will know if you are eligible to travel internationally if your employment authorization card is issued with the following text on the bottom center of the card which says ‘Serves as I-512 Advance Parole’ . If the Employment Authorization card does not indicate on the bottom center that it also serves as an advance parole card, then you cannot travel internationally. It is strongly advised that you consult with an attorney before making any travel plans. In some circumstances, it is not advisable for the applicant to travel even with a valid passport and employment authorization/advance parole card combo, because the interview date comes very close to the issuance of such card. Re-scheduling an interview is possible but can delay the case significantly. Thirdly, the employment authorization card allows the applicant to obtain their social security number by visiting their local social security office. Applicant’s can also mail the social security card application and supporting documents to the social security administration, but it is best to visit the office in person in order to expedite the process. Obtaining a social security number is important for tax, health care, and insurance purposes. To download the application and read the required supporting documentation please click here. Lastly, in addition, the applicant can obtain their state driver’s license once they have the employment authorization card in their possession. Please contact your local department of motor vehicles office to inquire about this process and the supporting documents that must be provided. The requirements vary by state. The interview stage is naturally the most important part of the process. In the majority of cases the employment authorization/advance parole combo card is received by the applicant prior to the interview, but in some circumstances it may arrive after or very close to the interview notice. It is very important to be well organized and well prepared for the interview. To read all about the interview stage please click here to go to our previous blog. For legal representation and to schedule a consultation please visit our website. Remember to follow us on our social media platforms which you can access to the right of this page.